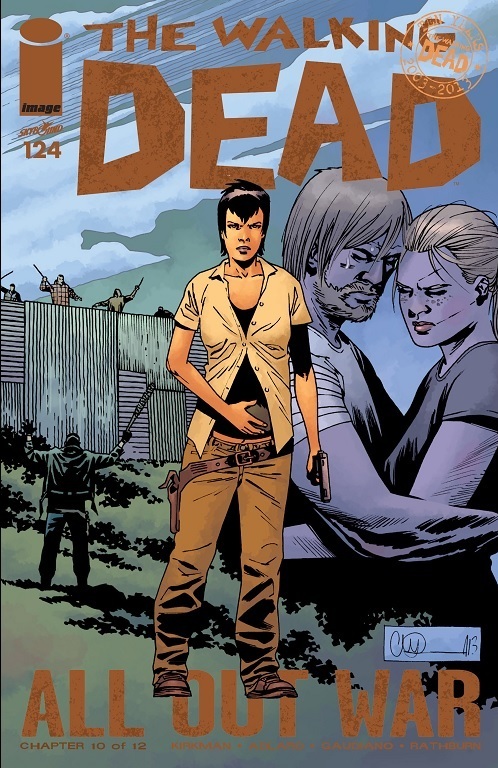 A Look at The Walking Dead #124: “All Out War,” Part 10 of 12 | What Else is on Now? Part 10 of “All Out War” was a fun read. We got some follow up to Eugene’s escape and he even had a brief moment to be a badass, but more so, this issue focused on a particular danger that seems to stalk the cast of The Walking Dead every episode: natural darkness. 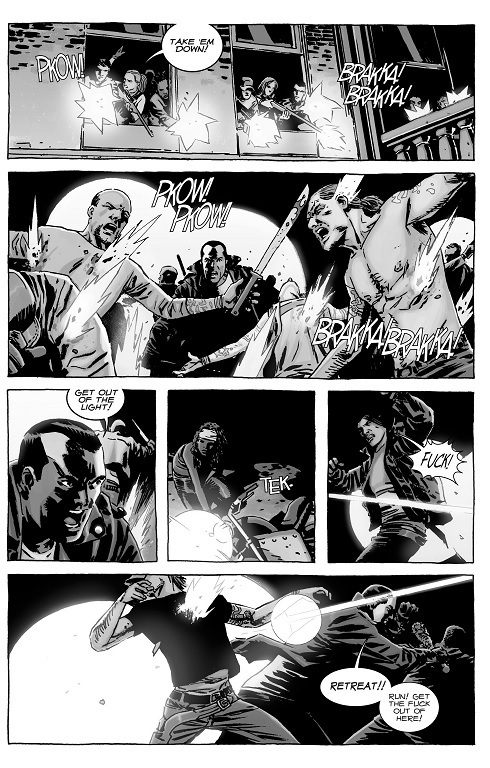 I never expected the night to play such a giant role in allowing Michonne and the others to get the jump on Negan’s men, but from a practical point of view, it makes perfect sense to use the darkness as a weapon. Too often the characters talk of not wanting to be alone in the middle of the night because that would make them a prime target for roamers. At the same time, as evidenced here, walking around in the dark makes you a prime target once the light is shined on you. Made for one hell of a surprise and I’m sure it will just tick Negan off even more, given how much he just wants to crush these people. We don’t actually get to spend much time with Rick and pals like we did last issue, as there’s no time for small talk, but since they’re in the heat of battle, there’s no need. 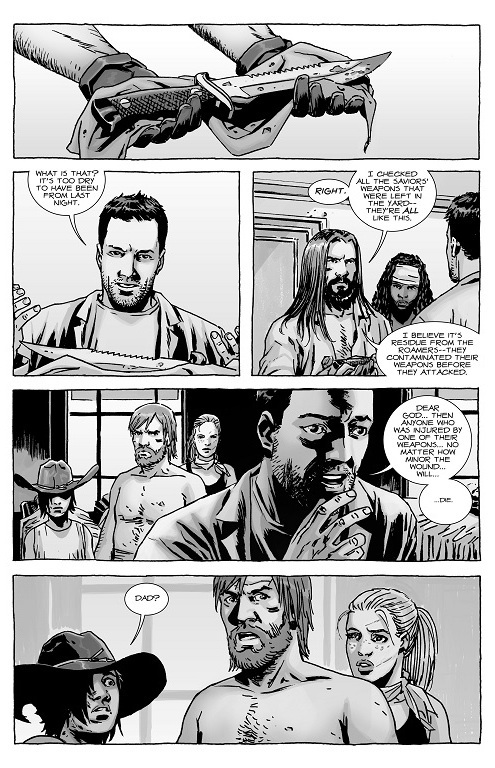 Plus, given how Rick’s fate is up in the air, chances are everyone will be preoccupied with that. As far as Rick goes, he shouldn’t be so quick to believe Dwight turned on him. I mean, Dwight has to save face in front of Negan. 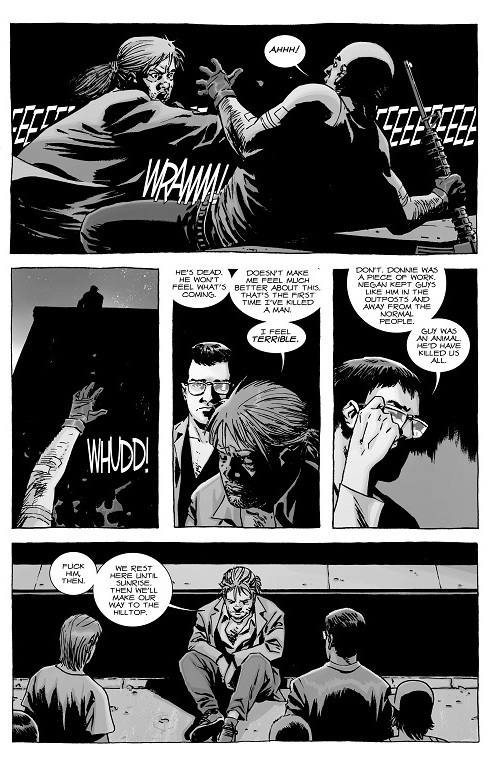 Given the severity of Negan’s plan to have his men cover their weapons in the guts of roamers, I think it’s safe to assume that Dwight probably didn’t contaminate his own weapons. As this plan hasn’t been tested, it’s hard to tell if it will even work. But this is Robert Kirkman, and the man has proven before that he knows how to throw you a curveball you don’t want. 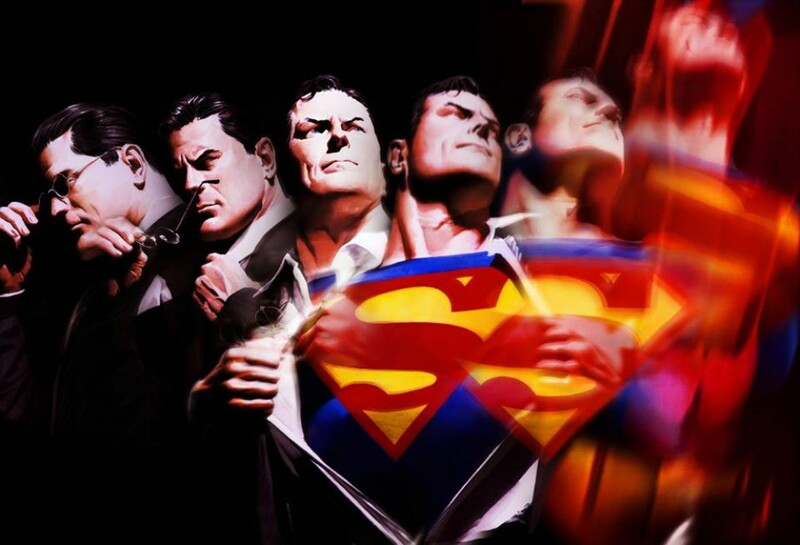 And as this current story arc is nearing its conclusion, I have a gut feeling someone is about to meet their end.